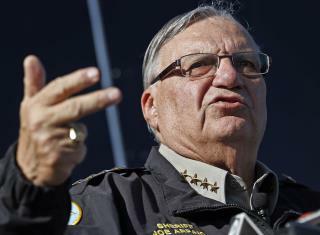 (Newser) – Prosecutors said Tuesday they will charge Sheriff Joe Arpaio with criminal contempt-of-court for defying a judge's orders to end his signature immigration patrols in Arizona, exposing the 84-year-old lawman to the possibility of jail time and clouding his political future as he seeks a seventh term. The announcement in federal court sets in motion criminal proceedings against the sheriff less than a month before Election Day and comes as he has taken on a prominent role on the national political stage in 2016, appearing alongside Republican presidential nominee Donald Trump on several occasions. Arpaio has acknowledged violating the order to stop the immigration patrols but insists his disobedience wasn't intentional. I'm sure Sherrif Joe loves this country as much or more than I do, which is why he has to obey the laws, and also pay the price when he breaks them. Enjoy sleeping in those tents; of course that will never happen. BLINDER WARNING: All those who feel you must, put them on now. Here is what is really going on: the government is pro illegal immigration. The need to consume enhances the economy, don't you know. Anybody who disagrees is an automatic racist bigot. For many of us: we are anti illegal immigration. (Actually I also might not be the only person who is anti ALL immigration, but that's another discussion.) Nothing can be done when there are too many people, most of whom wish to flood into the US because they're so poor and we're so rich. Nothing at all. What will be will be. The lifeboat has actually been sinking a long time. It's just the biased news and entertainment media that makes it look otherwise. Though I don't agree with all of his tactics, I only hope the sheriff will be able to beat this rap eventually. a true american hero! Arpaio for prez!